some more choice but in my opinion there has been nothing to compare to places like Temple of Seitan in London. That is, until now. After seeing on Facebook that an American style vegan diner was opening in Gateshead I couldn’t wait to visit because this sounded like exactly what I had been waiting for. 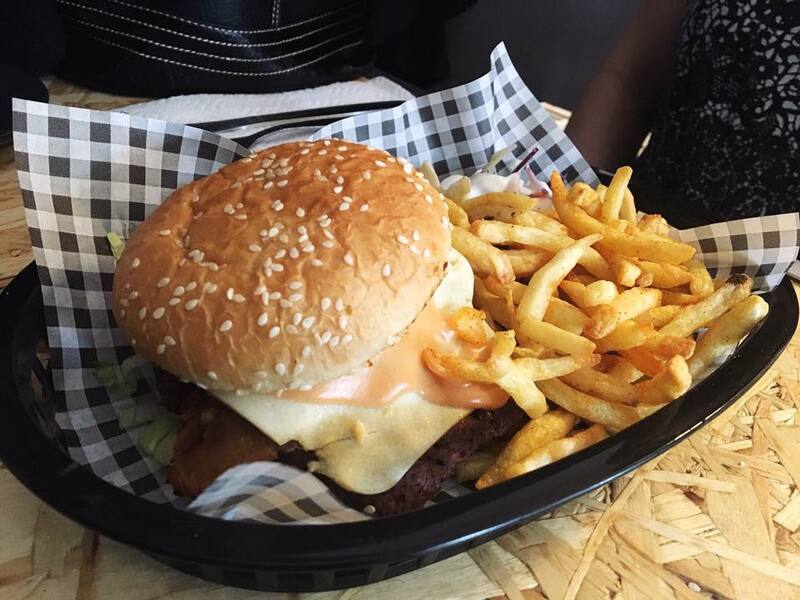 Grumpy Panda opened on the 4th July and the menu is extensive, offering hot dogs, burgers, breakfasts, waffles, milkshakes and more. They make all their ‘eggs’, ‘meat’ and ‘cheese’ on site and from scratch and this made it all the more enticing. It’s so underwhelming when you try a new place for food and they use the same shop bought meats and cheeses that you could pick up yourself and recreate at home for a lot cheaper. I love having the option of vegan cheese when I’m out but it does get a bit boring when everywhere uses Violife so the option of a homemade cheese was definitely a bonus. Currently Grumpy Panda is open Tuesday to Saturday and unluckily for me those are also the days I work so it’s taken me a few weeks before I managed to actually go and try it. It’s a really short walk from the Gateshead metro station and is as simple as going up one street and turning onto another. I visited with my mum on a Tuesday afternoon which I didn’t expect to be a particularly busy time with it being midweek but nearly all the tables were full. There isn’t a lot of seating available so depending on when you go there might be a bit of a wait but this is pretty typical for independent vegan eateries so I wasn’t really surprised and it’s definitely worth the wait. As I mentioned before you’re definitely spoilt for choice with the menu and there were so many things I wanted to try. My mum went for The Panda Style Burger so I decided to go for The Full Fry Up but swapped out the mushrooms for hash instead. One thing I really miss since committing to eating plant based is a full English breakfast and although you can make your own vegan breakfast it can end up quite expensive buying all the different components. 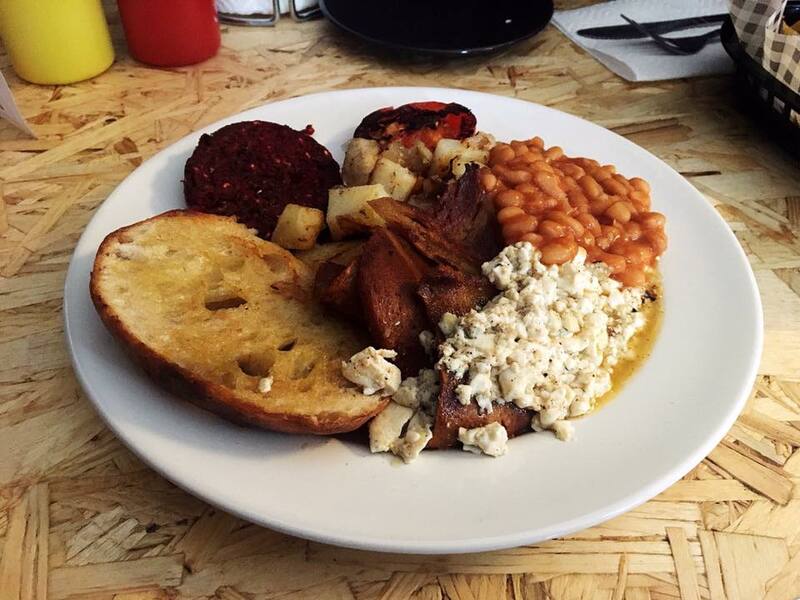 I’ve been to a few different places which offer a vegan version of the full English but I’m always left disappointed because there’s just something missing. Like I said before, I love junk food and a lot of the breakfasts I’ve tried have been less fry up and more just a plate of mushrooms, tomatoes and beans which works for some people but not for me. As someone who has absolutely no qualms about eating fake meat I was really excited about the description of Grumpy Panda’s breakfast, especially since they offer a ‘pigless pudding’ which makes it quite unique. I can safely say it was hands down the best breakfast I’ve had since giving up meat. Every part of the meal was good, with the tofu scramble being the closest things I’ve had to scrambled eggs without it actually being scrambled eggs. A lot of fake bacon is quite dry, thin and tasteless but this was the complete opposite and this made for such a pleasant surprise. Even the tomatoes, which I usually leave uneaten on my plate, were cooked to absolute perfection. I was slightly hesitant about the pigless pudding because I didn’t know what to expect but it was a nice addition to make the meal stand out and although I’m not sure what was in it, it tasted really good. You can definitely tell that they make their own eggs and meats and it makes such a difference in terms of quality. And for £6 for the whole thing it is such a bargain. My mum’s burger was received with similar enthusiasm and having tried a forkful I can testify that that it’s also worth trying. The cheese it came with didn’t have the sticky, sometimes rubbery affect that a lot of vegan cheeses have and as someone who isn’t vegan my mum had no complaints. The meal was so filling by itself but I had seen that Grumpy Panda offered milkshakes and since I haven’t had a milkshake in about two years I really wanted to try one. They’re not something I think I even bought often when I did eat dairy but now that I can’t have them as easily when I have the option now I usually get one. There’s a choice of flavours whether you want Cookies and Cream, Banana Split, Coffee Cake or Mud Pie. I went for Mud Pie and if I remember correctly it was a combination of bananas, chocolate soy milk and Oreos. I’ve probably missed something out there so don’t hold me to it but it tasted incredible. Even though Grumpy Panda was a bit further out that I tend to travel for food, it was well worth the journey and I’ll definitely be going again. The diversity of the menu means that you won’t get bored by having to order the same types of food and I’m excited to try their other options, especially things I haven't seen elsewhere like vegan waffles and pancakes. I'm so happy somewhere like this has finally opened in the North East and can't wait to visit again.